It’s been one year since my degree show. I studied BA Fine Art: Print and Time Based Media (PTBM) at Wimbledon College of Arts. A year ago I ate my Instagram account. I guess the way I felt about myself transformed so much from producing the piece, it was just natural to not use Instagram anymore. I still have an Instagram account for my art, but I don’t have one for personal use or post selfies on it, and I didn’t need it to affirm my identity anymore. It’s been a great year, but it’s been a lot healing and rebuilding – I guess I’m still figuring it out, probably always will be. While at Wimbledon I worked collaboratively with my best friend and course-mate Indigo Branscombe throughout my degree. Indigo’s from Orkney; a group of islands off of the north coast of Scotland. Their home is one of the smallest, northernmost of the Orkney Isles: Papa Westray. Indigo moved back there after graduating. After my degree I went to live in Finland for a bit, in search of a different, calmer way of living; satisfying an ongoing, guttural pull to the north. My degree show was a literal act of bodily self-destruction – cutting up my clothes, removing my make-up, ingesting thousands of Instagram images and shaving away my hair. I was blank now. Heading north, I was looking for a way of being after all of that. I wanted to feel embodied and complete, and dreaming of reconnecting with Indigo across the water. I wanted to think about how the North Sea that divided us could become a space for collaboration. 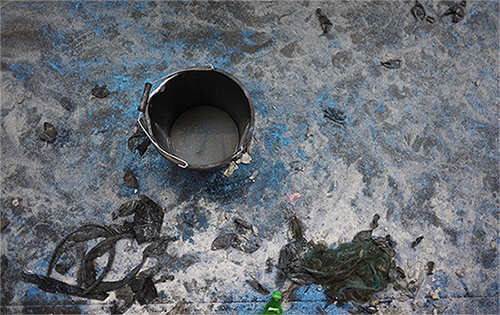 Indigo has always told stories from their Islands. I came to know Orkney through their tales. The islands were relayed to me in folklore and wool; as Indigo developed her textiles and storytelling practice alongside me in our Wimbledon studio. In many of the Orcadian stories, creatures appear in the interchangeable shape of men and seals; fin-folk, or selkies. Selkies shed their skins on land and only by means of the skin may they return to the water. In the Nordic countries, where I was, selkie tales are also heard. All selkies must eventually return to the sea, and no land-based pleasure can ever inhibit their desire for the water. We read the folklore through feminist, queer and trans lenses. For example, often a selkie leaves their husband and children to return to the waters. We saw this as an inherently feminist act, and queer in it’s mirroring of the way in which, despite imprisonment in heterosexual marriages and cultures, queer women have come together across history. A trans metaphor lies in the skin, another truer form, unseen by land-folk, reflected in the water. Through the tales, we are working towards a queer understanding of ecologies of the north. 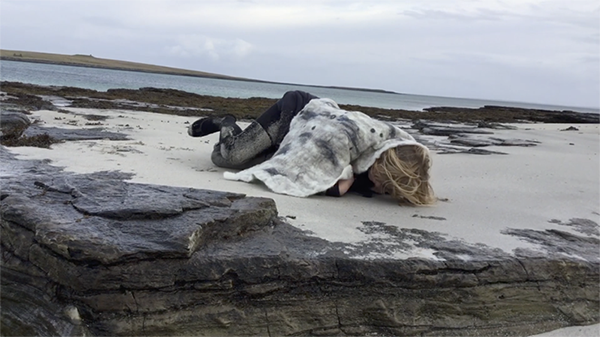 We work with wet felting – a technique found in the northern isles and the Nordic countries and connected to the land. Felting; taught to me by Indigo via a hilarious email containing her own photo instructions. We felted our own selkie skins, and called across the sea. This project is about queer longing, frustration and being between things, between human and seal, male and female, land and sea. I think it’s radical to talk about queer romance within friendships; radical to talk of love beyond normative romantic, sexual love, between two people. I think we need to broaden and queer the way we think about intimacy and love. I want to end the privileging of one type of love in our culture. I also wanted to think about what it means to be queer or trans outside of a city. How does a trans body exist on a mountain? Can I have a queer relationship with the sea? Now I’m always felting. I love the feeling of wool in my hands. 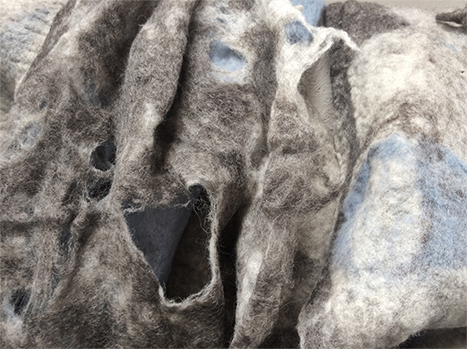 I curl up softly in my felted selkie skin and feel safe. Now, because of selkies and felt, I am always connected to Indigo, despite our continuing geographical separation. Carrying the story with me through my first year since graduating has been important. Stories are powerful in helping us understand ourselves and build identities. And I needed a new identity. Everyone who has ever been a child remembers identifying with a particular fairy tale or myth; recognising themselves inside of a story. I feel my queer body and vital friendship with Indigo deeply inside of the selkie tales. Right now, I am doing an arts programming internship at the Scottish sculpture workshop in rural north eastern Scotland. A place where selkie tales are also heard. I am learning how to be in my body and with this land. Also how to be with a sculpture workshop, a foundry and a forge; here as a soft, queer person. It feels like the right place to bring closure to this journey, before carrying my story down to London to perform at Tempting Failure festival. It’s a homing thing too – returning, moving in circles, not lines. As much as I might like it not to be, the project is also about London, it’s about the Thames, the noise from the city, and the four years I spent studying there and being next to Indigo. It’s a strange feeling, reflecting on this journey one year on. I am holding the selkie tale in my bones, sounding it through the places I go. It’s been a weird, nomadic existence. I follow the tale, it moves my practice and it moves my body; in physical, geographical and emotional ways. I was blank a year ago, and somehow understanding myself as a queer selkie, connected to Indigo on her northern island has been a beautiful way of coping; of becoming, being, transitioning, breathing. This isn’t a manifesto for how to cope after graduation, we all find our own ways and our own stories. It is all about breathing in the end. There’s no answer; no right way to be a person, or an artist, or a seal. But we all have to keep breathing. My performance: ‘SELKIE SKIN’ is being developed under Tempting Failure festival’s mentoring programme for emerging artists, under the mentorship of Helena Goldwater and will be performed at 3:30pm, 13 July 2018 at Matthews Yard Gallery, Croydon. Go to the website to find out more details. See Natalie’s website more of their work.